January 2, 2019: After 2 years in the making, Sight & Sound Theater has pulled back the curtain on their next original stage production coming to Lancaster in 2020. 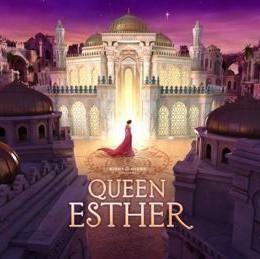 Set in the opulent yet perilous Persian Empire, "Queen Esther" is a captivating tale of beauty and bravery. It will be a true experience, with magnificent sets, special efffects and live animals, expected to draw nearly 1.5 million audience members. This will be their fifth new production to utilize Omni-Directional set moving equipment from Vetex, and promises to be just as spectacular as all of the others. October 4, 2018 - Vetex recently completed a customized refirbished SIDEWINDER for Hollywood Vaults of Los Angeles, CA. The customer wanted the "coolest" lift truck ever built. The SIDEWINDER had a head start on all other trucks to start, with its Omni-Directional Drive and Dual Joystick control, but owner David Wexler wanted to take it to the next level. Vetex installed maintenance free pure lead battery technology with on board charging, tail lights, brake lights, head lights, backup lights, clearance lights, and turn signals. Not enough? Add forward and rear facing light bars with amber back lighting. Still not enough? How about Laser fork alignment? More? OK, top it all off with million color LED effects lighting on all four wheels, under the dash, and in the over head guard. That should do it! 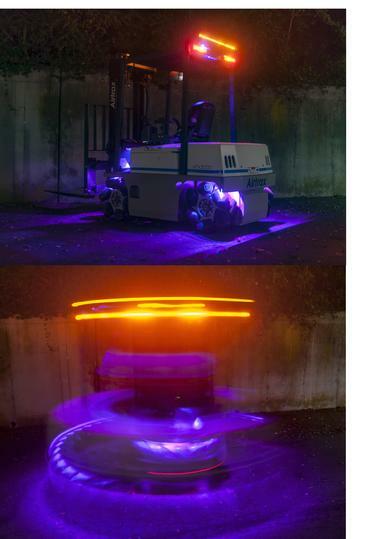 He's created an awe inspiring, load moving, rolling light show! 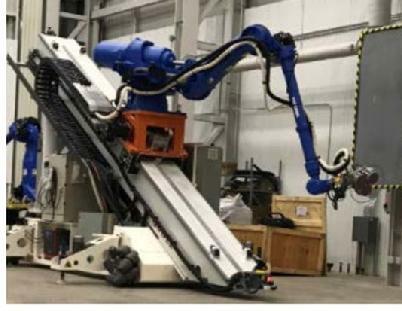 May 5, 2018 - The A5 Robot (Advanced Automation for Agile Aerospace Applications) recently completed a successful sanding demonstration at SwRI in San Antonio, TX as the Phase I development neared completion. 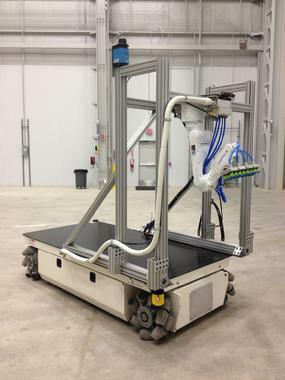 The 22,000# mobile robot has a Vetex Omni-Directional Platform as its base, with a Gudel Rail, and Motoman Robot Arm. It utilizes the ROS-I operating system. 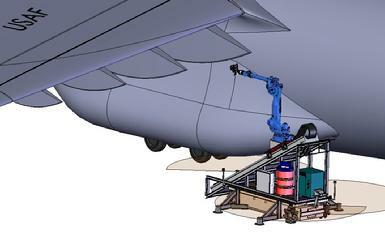 The A5 will be tested on an actual C-17 aircraft in the fall of this year, prior to moving into production next year. October 7, 2017 - Construction is complete - the CO issued, and we are moving in! 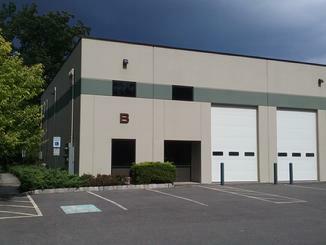 Our new warehousing facility in Lambertville NJ, will allow us to consolidate our inventories from Ewing NJ, Trenton NJ, Southampton PA, and Bristol PA into one location, greatly increasing our efficiency. Our plan is to have this warehousing consolidation complete by the end of November, and in the following months, to expand at this site to co-locate our offices and vehicle integration operations. Our systems development operation will remain in Ewing NJ for the foreseeable future. 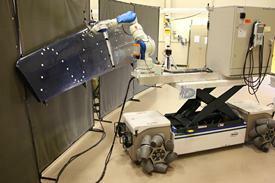 April 1, 2017 – A team from National Center for Defense Manufacturing and Machining (NCDMM), The Boeing Company, and Southwest Research Institute (SwRI) have been awarded a contract to help the U.S. Air Force develop software and technology to make advanced robotics reusable for a variety of aerospace manufacturing and maintenance processes. NCDMM will manage the program. Boeing will provide expertise. SwRI will develop software using the Robot Operating System Industrial (ROS-I) platform and will integrate all the subsystems on a large mobile manipulator robotic platform. 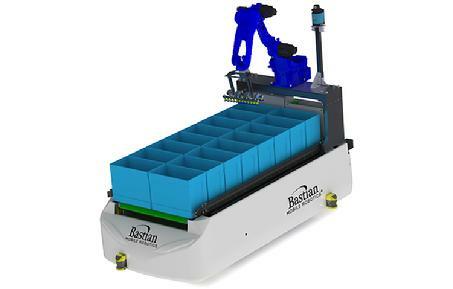 The base robotic mobility/stability platform will be provided by Vetex and the robot by Yaskawa Motoman. The system is equipped with an intelligent end-of-arm-tool and vision system, capable of retrieving and picking multiple types of products, eaches and SKUs for various orders at a time. 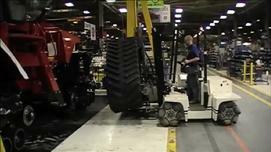 The system will build 2 mixed pallets every 15 minutes. 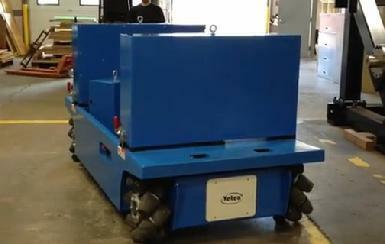 It is built on a Vetex RMP17 Omni-Directional axle kit, and is equipped with a Yaskawa Motoman robot arm. March 1, 2017 - Sight and Sound Theaters announced the new production "JESUS" will open in 2018. Vetex recently conpleted delivery of three new scenery movers for this production. additional Vetex units will be re-purposed from other productions to help make this show the most spectacular extravaganza ever! 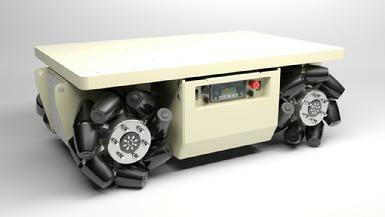 January 27, 2016 - Areva announced that they have completed validation of a new cavitation peening process for Nuclear Reactor asset management, that utilizes specialized tools mounted on Vetex remotely operated Omni-Directional Mobility Platforms. Vetex has provided Areva with three such units over the last several months and all three have been utilized in the validation and in operator training. Now they will be put to work. October 14, 2015 - The National Vehicle and Fuel Emmissions Laboratory in Ann Arbor unveiled a new tool to test the largest buses and semi-tractors for fuel economy and emmissions. The new Chassis dynamometer and 200 HP mobile fan provided by Prime One Contracting will help the lab simulate driving conditions in a real-time setting. The mobile fan, which is mounted on a Vetex Omni-Directional lift platform, will allow for air flow to be directed at the trucks on the dyno from a variety of distances, angles, and elevations, as well as permit drive through operation of the test cell. 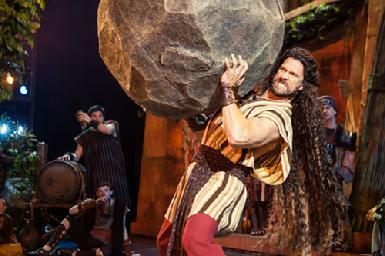 April 14, 2015 - Sight & Sound Theater announced their newest production "Samson" to premier in March 2016. Like the prior productions of Jonah and Moses, this one will also rely on Vetex Omni-Directional Scenery movers to provide some extraordinary visual effects. Five units will be performing in this production in Strasburg, PA, while the Moses show with seven movers, opens in Branson, MO. 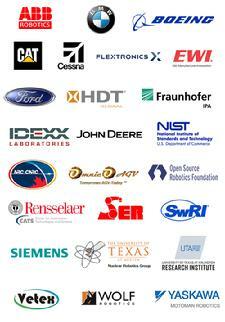 March 5, 2015 - Vetex became an associate member of the ROS Industrial Americas Consortium. We hope to be able to work with all of the members on their relevant Focused Technical projects, and bring the advantages of Omni-Directional Mobility to their applications. March 2014 - The Sight and Sound Theater production of "Moses" premiered this Month, featuring 7 Vetex Computer controlled Omni-Directional set movers. 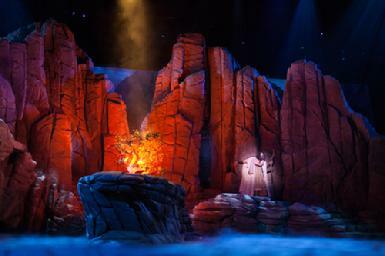 Some of the sets powered by Vetex platforms included the Mountains, the Burning Bush, the Bridge Sets and the Brick factory. This show has been acclaimed the most spectacular ever produced at the theater. 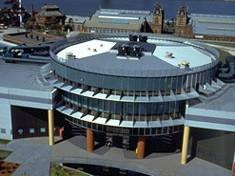 December 2013 - Science Works in the Victoria Museum in Australia opened an exhibit this month called "Think Ahead" featuring the Vetex Omni-Directional Wheel in a special exhibit about the future of transportation. 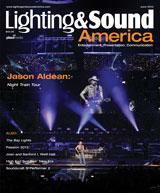 March 2013- Lighting & Sound America article features Vetex trackless scenery movers after sucessful season. 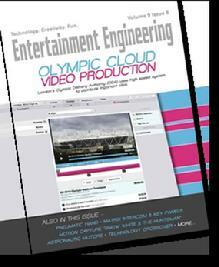 August 8, 2012 - Entertainment Engineering publishes a feature article in their online magazine, describing the merging of Vetex Omni-Directional Platforms with partner iTrack's navigation system for the entertainment industry. March 16, 2012 - OEM Off Highway Magizine publishes article "Movement Without Limits" by Sara Jensen, discussing Vetex Omni-Directional Technology, and products RoboMate and SIDEWINDER. 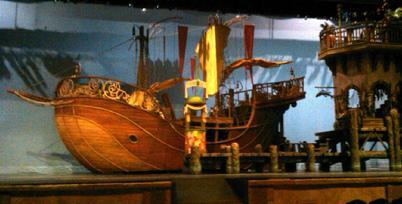 March 9, 2012 - "Jonah" premeired at the Sight & Sound Theater in Strasburg, PA to rave reviews from everyone. 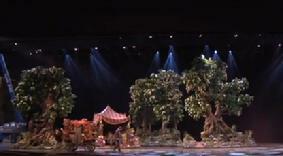 The show featured four major set pieces mobilized using Vetex Omni-Directional Mobility Platforms. At 50 feet long, 20 feet wide, 35 feet high, and 30,000 pounds, the "Demon of the Sea" is one of the largest set pieces ever built by Sight & Sound. The complex Omni-Directional movements of this, and the other sets, orchestrated by computer control, amazed and captivated the audience. The Big Boat "Demon of the Sea"
February 2012 - Department of Homeland Secruity releases this first photo of Vetex Mobility platform integrated with Back Scatter X-Ray Scanning capabilities by American Science and Engineering (AS&E). Click on photo to the left for more information. Click Photo to see a video of how Vetex platforms enable "Seamless Transitions"
January 2012 - Sight & Sound Theatres of Strasburg, PA announced the Premiere Performance of Jonah on March 9. The performance features four set pieces with Vetex RMP Omni-Directional Platforms, operating under computer control, to help provide "Seamless Transitions". The show promises to be truly spectacular! January 2012 - Progressive Engineer Magazine features a profile of Vetex president Nick Fenelli in their Jan-Feb online issue. Click the photo to the right to read the article. 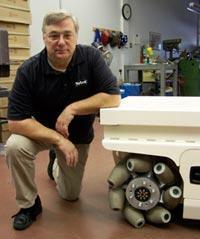 November 2011 - Vetex radio controlled Omni-Directional Mobility Platform arrives at Mikrolar in Hampton, NH. The platform will be outfitted with one of Mikrolar's hexapod robots for use by an as yet un-named aircraft manufacturer. 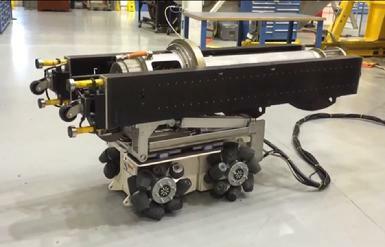 September 2011 - Southwest Research Institute Demonstrates a Metrology-Referenced Roving Accurate Manipulator (MR ROAM) performing numerically controlled path following. It is the marriage of a Vetex holonomic platform, Motoman 7 DOF manipulator, and Nikon iGPS system. 6 degree-of-freedom tool control is performed using iGPS feedback for compensation while the platform and manipulator are in motion. 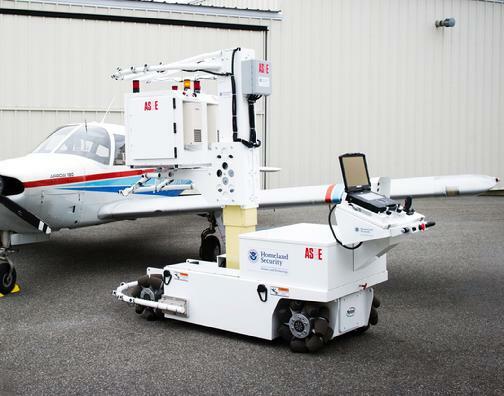 SwRI is promoting this technology as a lower cost alternative for tasks like aircraft paint stripping, masking, or decontamination. September 2011 - Mechanical Engineering Magazine publishes the Vetex story for the members of the American Society of Mechanical Engineers (ASME). 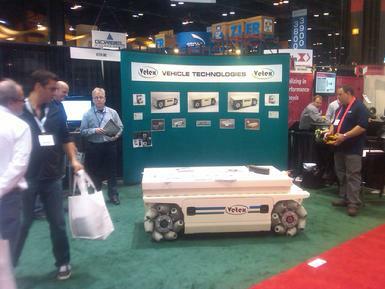 March 2011 - Vetex exhibited at ProMat in Chicago Ill. If you were unable to meet with us and see the equipment in action, we offer this consolation. We have compiled the literature distributed at the show into a single pdf file available for viewing or download by clicking the booth photo to the left. Call or write us if you have a need for any additional information. We will be happy to help you achieve the optimum Omni-Directional solution for your logistic, materials handling, or mobility problem.